The odds of computers becoming thoughtful enough to decide they want to take over the world, hatch a nefarious plan to do so, and then execute said plan remain exquisitely small. Yes, it’s in the realm of the possible. No, it’s not in the realm of the probable. If you want to worry about existential threats, I would suggest that the old-school Biblical ones — flood, famine, pestilence, plague, war — are still the best place to set your sights. All fine. But Carr is begging one question and failing to observe a salient point. First, it seems he is only willing to commit to his skepticism for “the near future.” That is prudent, but then one might want to know why we should not be concerned about a far future when efforts today may lay the groundwork for it, even if by eliminating certain possibilities. Second, what he does not pause to notice is that everyone agrees that “flood, famine, pestilence, plague and war” are bad things. We spend quite a serious amount of time, effort, and money trying to prevent them or mitigate their effects. But at the same time, there are also people attempting to develop machine consciousness, and while they may not get the resources or support they think they deserve, the tech culture at least seems largely on their side (even if there are dissenters in theory). So when there are people saying that an existential threat is the feature and not the bug, isn’t that something to worry about? Margaret Atwood has been getting her feet wet in the sea of issues surrounding developments in robotics and comes away with some conclusions of corresponding depth. Robots, she says, are just another of the extensions of human capacity that technology represents, they represent a perennial human aspiration, maybe they will change human nature, but what is human nature anyway? This is all more or less conventional stuff, dead center of the intellectual sweet spot for the Gray Lady, until Atwood gets to the very end. What really concerns her seems to be that we would commit to a robotic future and then run out of electricity! That would pretty much destroy human civilization, leaving behind “a chorus of battery-powered robotic voices that continues long after our own voices have fallen silent.” Nice image — but long after? That’s some battery technology you’ve got there. The robots would not care to share any of that power? 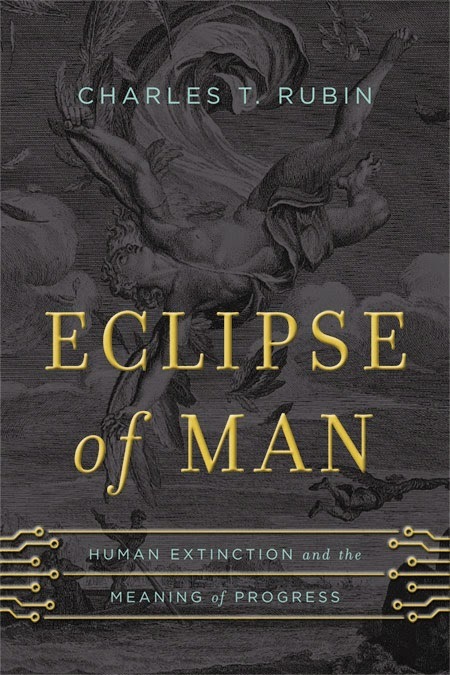 As I discuss in my new book Eclipse of Man: Human Extinction and the Meaning of Progress, most of those who believe in “Our Robotic Future,” as Atwood’s piece is titled, do so with the expectation that it is part and parcel of an effort at overcoming just the kind of Malthusian scarcity that haunts Atwood. They may of course be wrong about that, but given the track record of ongoing innovation in the energy area, it is hard to see why one would strain at this particular gnat. Then again, the NYT essay suggests that most of Atwood’s literary knowledge of things robotic seems to end by the 1960s. Atwood’s own bleak literary futures seem to focus on the biological; maybe she has not got the transhumanist memo yet. —Charles T. Rubin, a Futurisms contributor and contributing editor to The New Atlantis, is a Fellow of the James Madison Program at Princeton University. Human Flourishing or Human Rejection? Even if the sources of our misery have not changed over time, the way we think about them has certainly changed between the ancient world and ours. What was once simply a fact of life to which we could only resign ourselves has become for us a problem to be solved. 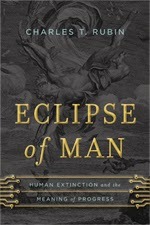 When and why the ancient outlook began to go into eclipse in the West is something scholars love to discuss, but that a fundamental change has occurred seems undeniable. Somewhere along the line, with thinkers like Francis Bacon and René Descartes playing a major role, people began to believe that misery, poverty, illness, and even death itself were not permanent facts of life that link us to the transcendent but rather challenges to our ingenuity in the here and now. And that outlook has had marvelous success where it has taken hold, allowing more people to live longer, wealthier, and healthier lives than ever before. So the transhumanists are correct to point out that the desire to alter the human condition runs deep in us, and that attempts to alter it have a long history. 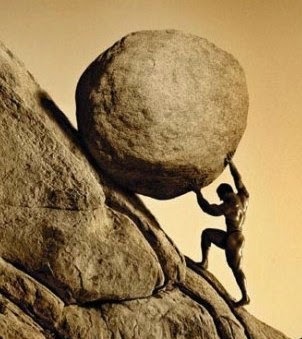 But even starting from our perennial dissatisfaction, and from our ever-growing power to do something about the causes of our dissatisfaction, it is not obvious how we get from seeking to improve the prospects for human flourishing to rejecting our humanity altogether. If the former impulse is philanthropic, is the latter not obviously misanthropic? Do we want to look forward to a future where man is absent, to make that goal our normative vision of how we would like the world to be? Francis Bacon famously wrote about “the relief of man’s estate,” which is to say, the improvement of the conditions of human life. But the transhumanists reject human life as such. Certain things that may be good in certain human contexts — intelligence, pleasure, power — can become meaningless, perverse, or destructive when stripped of that context. By pursuing these goods in abstraction from their human context, transhumanism offers not an improvement in the human condition but a rejection of humanity. 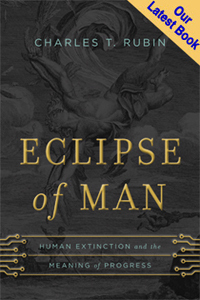 For much more of Charlie Rubin’s thoughtful critique of transhumanism, pick up a copy of Eclipse of Man today. Editor’s Note: In 2010, Mark Gubrud penned for Futurisms the widely read and debated post “Why Transhumanism Won’t Work.” With this post, we’re happy to welcome him as a regular contributor. Okay, fair warning, this review is going to contain spoilers, lots of spoilers, because I don’t know how else to review a movie like Transcendence, which appropriates important and not so important ideas about artificial intelligence, nanotechnology, and the “uploading” of minds to machines, wads them up with familiar Hollywood tropes, and throws them all at you in one nasty spitball. I suppose I should want people to see this movie, since it does, albeit in a cartoonish way, lay out these ideas and portray them as creepy and dangerous. But I really am sure you have better things to do with your ten bucks and two hours than what I did with mine. So read my crib notes and go for a nice springtime walk instead. 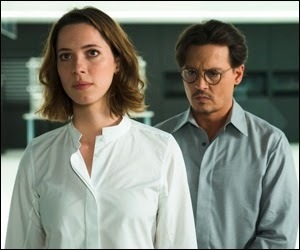 Set in a near future that is recognizably the present, Transcendence sets us up with a husband-and-wife team (Johnny Depp and Rebecca Hall) that is about to make a breakthrough in artificial intelligence (AI). They live in San Francisco and are the kind of Googley couple who divide their time between their boundless competence in absolutely every facet of high technology and their love of gardening, fine wines, old-fashioned record players and, of course, each other, notwithstanding a cold lack of chemistry that foreshadows further developments. The husband, Will Caster (get it? ), is the scientist who “first wants to understand” the world, while his wife Evelyn is more the ambitious businesswoman who first wants to change it. They’ve developed a “quantum processor” that, while still talking in the flat mechanical voice of a sci-fi computer, seems close to passing the Turing test: when asked if it can prove it is self-aware, it asks the questioner if he can prove that he is. This is the script’s most mind-twisting moment, and the point is later repeated to make sure you get it. Since quantum computing has nothing to do with artificial intelligence now or in the foreseeable future, its invocation is the first of many signs that the movie invokes technological concepts for jargon and effect rather than realism or accuracy. This is confirmed when we learn that another lab has succeeded in uploading monkey minds to computers, which would require both sufficient processing power to simulate the brain at sub-cellular levels of detail, and having the data to use in such a simulation. In the movie, this data is gathered by analyzing brain scans and scalp electrode recordings, which would be like reading a phone book with the naked eye from a thousand miles away. Uploading might not be physically impossible, but it would almost certainly require dissection of the brain. Moreover, as I’ve written here on Futurisms before, the meanings that transhumanists project onto the idea of uploading, in particular that it could be a way to escape mortality, are essentially magical. Later, at a TED-like public presentation, Will is shot by an anti-technology terrorist, a member of a group that simultaneously attacks AI labs around the world, and later turns out to be led by a young woman (Kate Mara) who formerly interned in the monkey-uploading lab. Evading the FBI, DHS, and NSA, this disenchanted tough cookie has managed to put together a global network of super-competent tattooed anarchists who all take direct orders from her, no general assembly needed. Our hero (so far, anyway) survives his bullet wound, but he’s been poisoned and has a month to live. He decides to give up his work and stay home with Evelyn, the only person who’s ever meant anything to him. She has other ideas: time for the mad scientist secret laboratory! Evelyn steals “quantum cores” from the AI lab and sets up shop in an abandoned schoolhouse. Working from the notes of the unfortunate monkey-uploading scientist, himself killed in the anarchist attack, she races against time to upload Will. Finally, Will dies, and a moment of suspense ... did the uploading work ... well, whaddya think? No sooner has cyber-Will woken up on the digital side of the great divide than it sets about rewriting its own source code, thus instantiating one of the tech cult’s tropes: the self-improving AI that transcends human intelligence so rapidly that nobody can control it. In the usual telling, there is no way to cage such a beast, or even pull its plug, since it soon becomes so smart that it can figure out how to talk you out of doing so. In this case, the last person in a position to pull the plug is Evelyn, and of course she won’t because she believes it’s her beloved Will. Instead, she helps it escape onto the Internet, just in time before the terrorists arrive to inflict the fate of all mad-scientist labs. Once loose on the Web — apparently those quantum cores weren’t essential after all — cyber-Will sets about to commandeer every surveillance camera on the net, and the FBI’s own computers, to help them take down the anarchists. Overnight, it also makes millions on high-speed trading, the money to be used to build a massive underground Evil Corporate Lab outside an economic disaster zone town out in the desert. There, cyber-Will sets about to develop cartoon nanotechnology and figure out how to sustain its marriage to Evelyn without making use, so far as we are privileged to see, of any of the gadgets advertised on futureofsex.net (NSFW, of course). Oh, but they are still very much in love, as we can see because the same old sofa is there, the same old glass of wine, the same old phonograph playing the same old song. And the bot bids her a tender good night as she slips between the sheets and off into her nightmares (got that right). So what about these nanites? 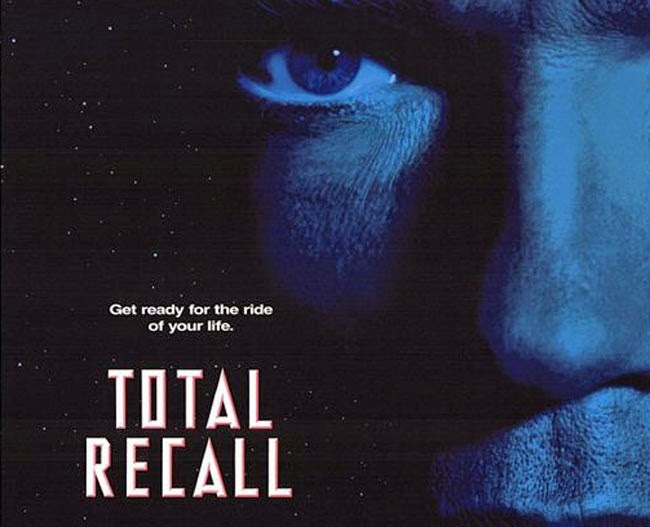 It might be said that at this point we are so far from known science that technical criticism is pointless, but nanotechnology is a very real and broad frontier, and even Eric Drexler’s visionary ideas, from which the movie’s “nanites” are derived, have withstood decades of incredulity, scorn, and the odd technical critique. In his books Engines of Creation and Nanosystems, Drexler proposed microscopic robots that could be programmed to reconfigure matter one molecule at a time — including creating copies of themselves — and be arrayed in factories to crank out products both tiny and massive, to atomic perfection. Since this vision was first popularized in the 1980s, we have made a great deal of progress in the art of building moderately complex nanoscale structures in a variety of materials, but we are still far from realizing Drexler’s vision of fantastically complex self-replicating systems — other than as natural, genetically modified, and now synthetic life. Life is often cited as an “existence proof” for nanobots, but life is subject to some familiar constraints. If physics and biology permitted flesh to repair itself instantly following a massive trauma, evolution would likely have already made us the nearly unstoppable monsters portrayed in the movie, instead of what we are: creatures whose wounds do heal, but imperfectly, over days, weeks, and months, and only if we don’t die first of organ failure, blood loss, or infection. 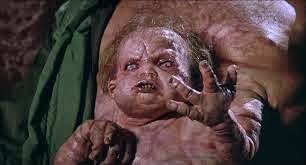 Not even Drexlerian nanomedicine theorist Robert Freitas would back Trancendence’s CGI nanites coursing through flesh and repairing it in movie time; for one thing, such a process would require an energy source, and the heat produced would cook the surrounding tissue. The idea that nonbiological robots would directly rearrange the molecules of living organisms has always been the weakest thread of the Drexlerian narrative; while future medicine is likely to be greatly enabled by nanotechnology, it is also likely to remain essentially biological. The movie also shows us silvery blobs of nano magic that mysteriously float into the sky like Dr. Seuss’s oobleck in reverse, broadcasting Will (now you get it) to the entire earth as rainwater. It might look like you could stick a fork in humanity at this point, but wouldn’t you know, there’s one trick left that can take out the nanites, the zombies, the underground superdupersupercomputer, the Internet, and all digital technology in one fell swoop. What is it? A computer virus! 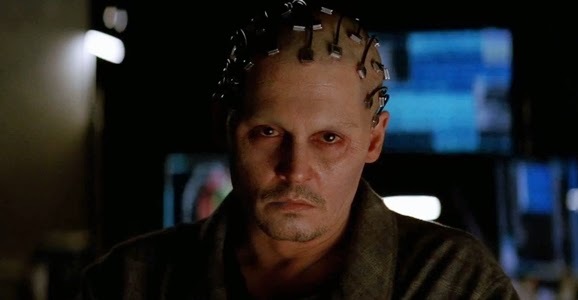 But in order to deliver it, Evelyn must sacrifice herself and get cyber-Will —by now employing a fully, physically reconstituted Johnny Depp clone as its avatar — to sacrifice itself ... for love. As the two lie down to die together on their San Francisco brass-knob bed, deep in the collapsing underground complex, and the camera lingers on their embraced corpses, it becomes clear that if there’s one thing this muddled movie is, above all else, it’s a horror show. Oh, but these were nice people, if a bit misguided, and we don’t mean to suggest that technology is actually irredeemably evil. Happily, in the epilogue, the world has been returned to an unplugged, powered-off state where bicycles are bartered, computers are used as doorstops and somehow everybody isn’t starving to death. It turns out that the spirits of Will and Evelyn live on in some nanites that still inhabit the little garden in back of their house, rainwater dripping from a flower. It really was all for love, you see. This ending is nice and all, but the sentimentality undermines the movie’s seriousness about artificial intelligence and the existential crisis it creates for humanity. Evelyn’s mistake was to believe, in her grief, that the “upload” was actually Will, as if his soul were something that could be separated from his body and transferred to a machine — and not even to a particular machine, but to software that could be copied and that could move out into the Internet and install itself on other machines. The fallacy might have been a bit too obvious had the upload started working before Will’s death, instead of just after it. It would have been even more troubling if cyber-Will had acted to hasten human Will’s demise — or induced Evelyn to do so. Instead, by obeying the laws of dramatic continuity, the script suggests that Will, the true Will, i.e. Will’s consciousness, his mind, his atman, his soul, has actually been transferred. In fact, the end of the movie asks us to accept that the dying Will is the same as the original, even though this “Will” has been cloned and programmed with software that was only a simulation of the original and has since rewritten itself and evolved far beyond human intelligence. We are even told that the nanites in the garden pool are the embodied spirits of Will and Evelyn. What was Evelyn’s mistake, then, if that can be true? Arrogance, trying to play God and cheat Death, perhaps — which is consistent with the horror-movie genre, but not very compelling to the twenty-first-century mind. We need stronger reasons for agreeing to accept mortality. In one scene, the pert terrorist says that cutting a cyborg off from the collective and letting him die means “We gave him back his humanity.” That’s more profound, actually, but a lot of people might want to pawn their humanity if it meant they could avoid dying. In another scene, we are told that the essential flaw of machine intelligence is that it necessarily lacks emotion and the ability to cope with contradictions. That’s pat and dangerous nonsense. Emotional robotics is today an active area of research, from the reading and interpretation of human emotional states, to simulation of emotion in social interaction with humans, to architectures in which behavior is regulated by internal states analogous to human and animal emotion. There is no good reason to think that this effort must fail even if AI may succeed. But there are good reasons to think that emotional robots are a bad idea. Emotion is not a good substitute for reason when reason is possible. Of course, reason isn’t always possible. Life does encompass contradictions, and we are compelled to make decisions based on incomplete knowledge. We have to weigh values and make choices, often intuitively factoring in what we don’t fully understand. People use emotion to do this, but it is probably better if we don’t let machines do it at all. If we set machines up to make choices for us, we will likely get what we deserve. 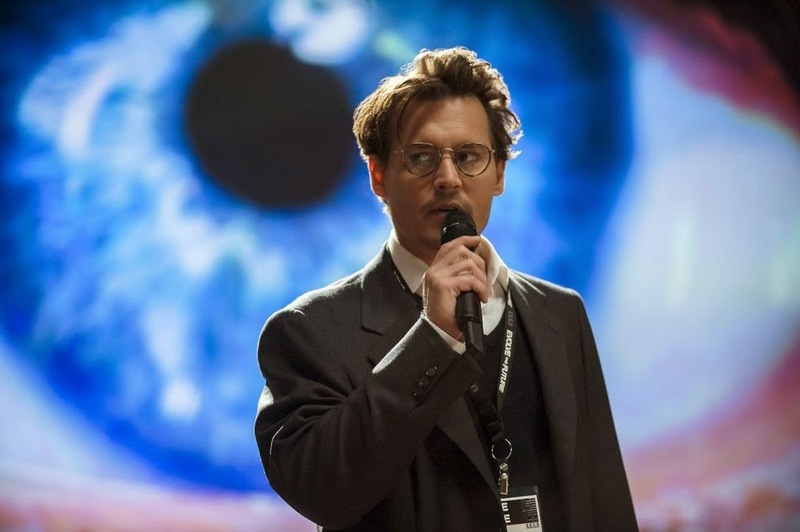 Transcendence introduces movie audiences, assuming they only watch movies, to key ideas of transhumanism, some of which have implications for the real world. Its emphasis on horror and peril is a welcome antidote to Hollywood movies that have dealt with the same material less directly and more enthusiastically. But it does not deepen anybody’s understanding of these ideas or how we should respond to them. Its treatment of the issues is as muddled and schizophrenic as its script. But it’s unlikely to be the last movie to deal with these themes — so save your ticket money.